In the folk legends Saint Anna, the mother of Virgin Mary, is the protector of marriage, the family, virginity, pregnant women and the widows. Therefore, on that day, women are not supposed to work, and men don’t go outside their village, otherwise mermaids would fall in love with them. In the evening men burn dry ox dung in front of the door to drive away evil spirits from the house. Women rub the udders of cows, sheep and goats with wood ashes, garlic and fat. The domestic birds are kept closed to be protected against magic. The young girls put a plate of salt and wheat under the oven, cover it with a white cloth and in the morning feed the cattle with it for health. If a man enters the house first, it is believed the newly born animals during the year will be male. This explains why women usually hurry to visit their neighbors first. This is the day of all medicine men and women. It is the nameday of Anna, Anita, Aneta and all derivatives (the name Anna means “blessing” in Hebrew). St. Anna, the mother of the Virgin Mary, was the youngest daughter of the priest Nathan from Bethlehem, descended from the tribe of Levi. She married St. Joachim, who was a native of Galilee. For a long time St. Anna was childless, but after twenty years, through the fervent prayer of both spouses, an angel of the Lord announced to them the Conception of a Daughter, Who would bring blessing to the entire human race. The Conception by St. Anna took place at Jerusalem, where also the Most Holy Virgin was born. The majority of icons dedicated to the Conception by St. Anna, portray the Most Holy Virgin trampling the serpent underfoot. In the icons, Sts. Joachim and Anna are usually depicted with hands folded in prayer; their eyes are also directed upward and they contemplate the Mother of God, Who stands in the air with outstretched hands; under Her feet is an orb encircled by a serpent (symbolizing the devil), which strives to conquer all the universe by its power. 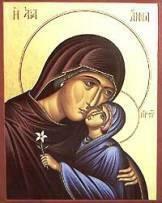 There are also icons of St. Anna holding the Most Holy Virgin on her left arm as an infant. St. Anna\\\\'s face has a look of reverence. From ancient times this Feast was especially venerated by pregnant women in the whole Orthodox Christian world.